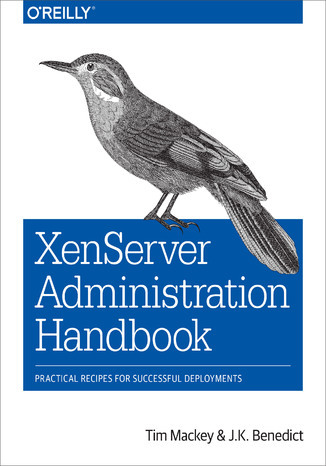 Packed with practical advice, this hands-on guide provides valuable information you need to most effectively optimize and manage the XenServer open source virtualization platform. Whether you run a modest installation of a few blades or multiple global enterprise datacenters, this book focuses on the most critical issues you...re likely to encounter when designing a XenServer deployment and helps you handle day-to-day management tasks.Tim Mackey and J.K. Benedict from Citrix Systems, the company that manages XenServer, show you how to design a deployment through best practices, deployment blueprints, and installation guidelines. The book...s second part features concise, easy-to-implement recipes for day-to-day management, such as user rights, backup strategies, and hardware maintenance.Learn precisely what makes a XenServer work, and how it can host 1000 virtual machinesExplore the core components of a production XenServer environmentInvestigate several options on how and where to install XenServerExamine several factors for "right sizing" your XenServer deployment to fit your needsWork with a decision tree to optimize your XenServer deployment designUnderstand how to accommodate guest VM virtualization modesUse recipes that help you plan for, obtain, and apply XenServer upgrades Ebook porusza temat XenServer. Jedną z istotnych spraw poruszanych w ebooki jest: Administration. Jeśli interesuje Cię: Handbook, to ebook dla Ciebie. Dużo wiedzy na temat: Practical w formacie EPUB, MOBI i PDF. Hasło przewodnie tego ebooka to Recipes. Jeśli szukasz ebooków o: Successful, to jest pozycja dla Ciebie. Dogłębna wiedza na temat Deployments. ISBN 978-1-4919-3539-2. Porównywarka cen ebooków, które dostępne są w formatach PDF, MOBI i innych. Na urządzenia Kindle i inne. Tutaj znajdziesz ebook, którego szukasz. Nie wszystkie ebooki w ofercie są darmowe. Wspierajmy autorów i kupujmy ebooki.